Is there a business task or process that you'd like to easily manage? Got a project currently being tracked in spreadsheets or being entered on paper forms? 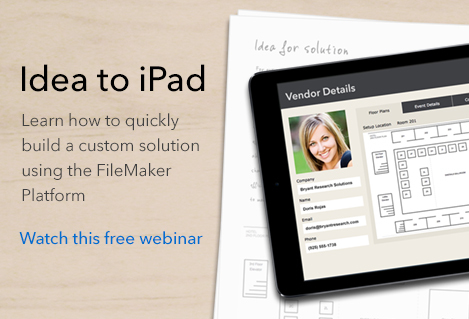 Watch as we build a custom solution using the FileMaker Platform and have it deployed to an iPad in under 60 minutes. 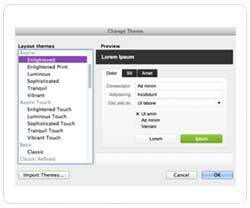 Themes were first introduced with FileMaker 12 and provided developers with a selection of preset themes that could be used to speed up layout design. The addition of themes was an improvement over the previously available options but was still rather limiting. With FileMaker 13, new tools have been introduced to help leverage the power of themes. FileMaker 13 solutions that are easy to use, and take advantage of the full functionality of the FileMaker Platform! For an introduction to FileMaker software, FileMaker Training Series: Basics is available as a free ebook. 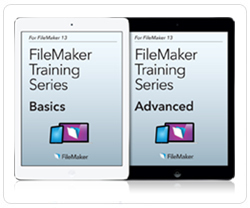 FileMaker Training Series: Advanced comes with a detailed, step-by-step manual and includes demo files, exercises and videos to help guide you through the materials. It is available on the FileMaker Store as a printed book and DVD for $39.99 USD or as an electronic download for $19.99 USD. Watch a preview of one of this year's most popular featured sessions at the 2014 FileMaker Developer Conference, "Layouts, Styles & Themes," an under the hood session. Speaker Andrew Paulsen, from FileMaker, Inc., will be focusing on improvements to styles, themes, and layouts in FileMaker 13. This session will give details to create desktop and mobile solutions that are fast, efficient, and visually stunning. The FileMaker Developer Conference is just around the corner with over 70 sessions to choose from at the biggest FileMaker event of the year. 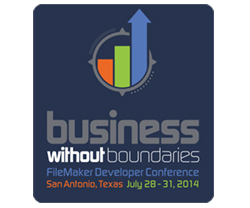 Come to DevCon 2014 and discover how the FileMaker Platform can help you run your business without boundaries. Join over 1,200 developers in San Antonio, Texas from July 28-31, 2014 and take the first steps to achieving your business goals. Tell the world about your amazing iOS solutions built with the FileMaker Platform! FileMaker is looking for great iPad and iPhone solutions created with the FileMaker Platform to publicize on the FileMaker website and in the media. If you have used the FileMaker Platform to create iOS solutions that work in a unique, money/time saving way, please send the details to Kevin Mallon, FileMaker Public Relations. FileMaker 13: Optimizations Using "Perform Script on Server"
Tim Dietrich Database ConsultingOne of my favorite new FileMaker 13 features is the "Perform Script on Server" script step (hereafter referred to as "PSOS"). PSOS enables us to send a request to a FileMaker Server so that it will run a specified script on the client's behalf (using the server's resources). Optionally, you can indicate whether or not the client should wait for the result of the script, or just proceed without waiting for the result. Now you can conveniently access your SeedCode Calendar Pro solution from your web browser with their latest update. With the added second set of scripts and layouts, Calendar Pro is now optimized for FileMaker WebDirect - the newest feature in FileMaker 13. FileMaker WebDirect lets you easily share and deploy your solutions via a web browser. Don't have Calendar Pro? EasySync by Tim Dietrich Database Consulting is an open source sync framework for the FileMaker Platform. You can use it to sync data between mobile devices (running FileMaker Go) and databases hosted on FileMaker Server. It uses FileMaker native functionality, no plug-ins or custom functions. Have FileMaker Pro, but no time to build that ideal solution to track that data or make your department more productive and efficient? Look for the "FileMaker Certified" symbol when searching for a consultant in your area. Sign up for the FREE FileMaker Technical Network and get access to exclusive technical information, software and the FileMaker technical community.